'S e 2 an Giblean an 92mh latha dhen bhliadhna a rèir a' Mhìosachain Ghriogaraich (93mh ann am bliadhna-leum). Tha 273 latha air fhàgail gus deireadh na bliadhna. 1453 ‎ – 29 an Cèitean –, ghlac Impireachd nan Otomanach Constantinople. 1792 - Francisco de Paula Santander, ann an Cúcuta. Saighdear agus fear-poileataigs à Coloimbia. 1805 - Hans Christian Andersen, sgrìobhadair às an Danmhairg. 1840 - Émile Zola, ann am Paris. Sgrìobhadair às an Fhraing. 1914 - Alec Guinness, ann an Lunnainn. Actair à Sasainn. 1917 - Ella Fitzgerald, ann an Newport News, Bhirginia. Seinneadair Aimeireaganach. 1914 - Paul Johann Ludwig von Heyse, sgrìobhadair Gearmailteach. 1928 - Theodore William Richards, ann an Cambridge (Massachusetts). Ceimigear às na Stàitean Aonaichte. 1974 - Georges Pompidou, ann am Paras. Ceann-suidhe na Frainge bho 1969 gu ruige 1974. 1995 - Hannes Alfvén, ann an Danderyd. Eòlaiche-fiosaig às an t-Suain. 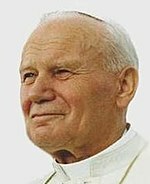 2005 - Karol Józef Wojtyła, ann an Cathair na Bhatacain. Pàp bho 1978 gu 2005. Air a tharraing à "https://gd.wikipedia.org/w/index.php?title=2_an_Giblean&oldid=533053"
Chaidh an duilleag seo a dheasachadh 15 dhen Iuchar 2017 aig 19:37 turas mu dheireadh.